I’ve lost count of the times I’ve attended a car launch and found the most fuel efficient version was also the most disappointing car in the range. Power is typically down, responses muffled and trim chosen from the sackcloth end of the options book. So it was refreshing and surprising to realise, at the launch of the 2012 Chevrolet Aveo this week, that the Eco model was the peach in this particular fruitbowl. The all-new Aveo – a roughly Fiesta-sized five-door hatchback – is offered with four basic engine options. There are two petrol choices – an 85bhp 1.2-litre or a 100bhp 1.4-litre – and there are two diesel options in the shape of a new 1.3-litre VCDi engine producing either 74bhp or 94bhp. And it’s the more powerful diesel unit that underpins the Aveo’s Eco version, which comes only in mid-range LT trim. Slightly longer gearing and low-rolling-resistance tyres bring the Eco edition’s CO2 emissions down from 108g/km to just 95g/km. And by starting with the more powerful diesel, the Eco special ends up a responsive, flexible and interesting little car to drive. Whistling along the country roads of the Cotswolds, it proved to be both frugal and fun. Getting this engine down to 95g/km is quite a feat, particularly in a car that comes with air conditioning, 15-inch alloys, and doesn’t feel as if the gears have been replaced with a slack rubber band. 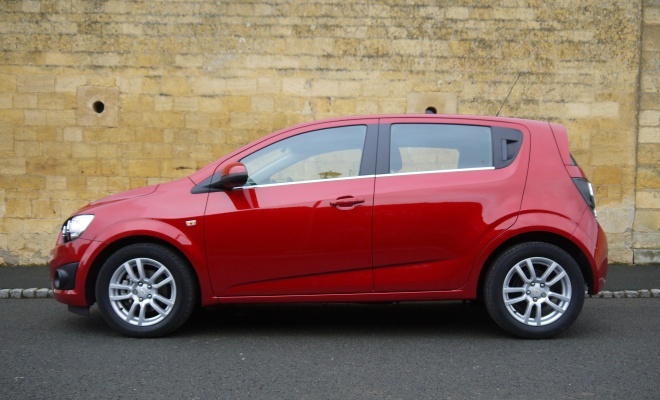 The slower 74bhp diesel Aveo would be the eco champ in most competitors’ ranges, given that it creeps into the free-tax-disc bracket and is congestion-charge exempt by virtue of its 99g/km CO2 output. But it’s an also-ran here. It’s not as eager or responsive as the Eco edition and ends up being noisier and harsher as it must work harder to keep up. At £12,795 the Aveo Eco diesel costs only £450 more than its 99g/km brother – but I’d argue that’s a pile of pennies well spent. All of the diesel editions benefit from a stop-start system that cuts the engine when the car stands still in neutral, firing it up again as the clutch is pushed. A button that disarms the system is hidden away between the front seats, aft of the gearlever. On paper, the 1.4 petrol looks as if it might be the best of the Aveo bunch, particularly for those who like a responsive throttle and who aren’t bothered by CO2 figures. It is the most powerful edition in the range, toting 100bhp. But on the road it felt underpowered and out of its depth compared to the Eco diesel. The difference is in the torque. The Aveo Eco serves up 190Nm from 1,750rpm, whereas the petrol needs to spool up to 4,000rpm to deliver its much lower peak of 130Nm. The result is that the Eco special scrabbles to 62mph just a little quicker than the perkiest petrol in the range, at 11.7 seconds versus 12.2 seconds. And that’s despite the diesel’s 75kg weight disadvantage. When you’re not using a stopwatch, the gap feels even bigger. And when you’d rather relax (and save fuel) the Eco car is again your friend. I found myself hunting up and down the petrol Aveo’s gearbox more often than I’d like, just to maintain speed on the dipping and cresting B-roads of my test route. At least the Aveo’s standard 5-speed manual gearbox is easy to use, if a little wide in the gate. You’ll never slot into the wrong gear, but equally you may find yourself stroking your passenger’s thigh. Which may be pleasant, or not, depending on your passenger. Only one car in the range gets a six-speed manual box – the 94bhp diesel when chosen in LTZ trim rather than in LT Eco guise. And if you’d like the six-speed automatic gearbox you’ll have to lump the 1.4-litre petrol that comes with it. Where the petrol models do win, of course, is in purchase price. The cheapest car in the range, a 1.2-litre 85bhp petrol in basic LS trim, starts at just £9,995. 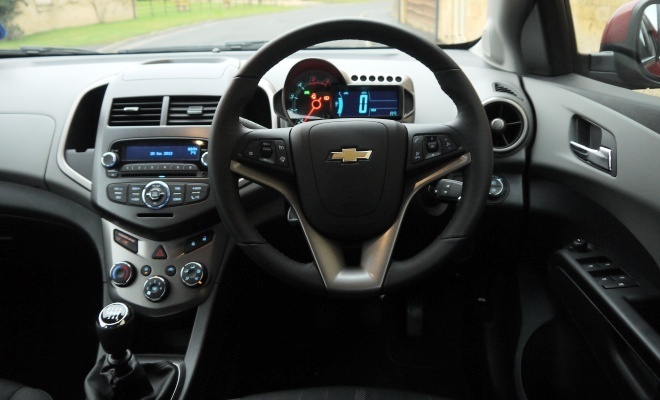 All Aveo models share a well-sorted chassis, which does a decent job of balancing precision and comfort. The steering is free of slack and slop, and the clutch, throttle and brake all have similar weights. It doesn’t feel nearly as aggressive or sporty as the eagle-stare headlights and gaping grille might suggest, but it’s not a soggy old broiler either. 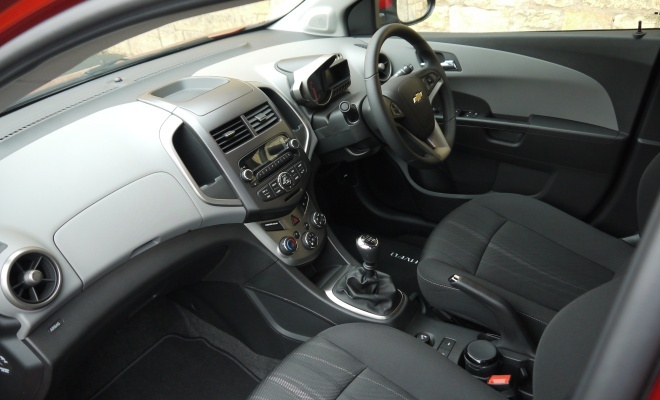 Inside, Chevrolet serves up an interior that looks and feels pretty good for the price. The upper surfaces of the dashboard and doors are swathed in a pale, soft plastic that somehow didn’t create the windscreen reflections I expected. The wheel adjusts over a wide range, making it easy to get a good view of the instruments. The cluster is an odd-looking plastic pod standing proud of the dashboard surface, looking a little tacked-on. Apparently its design was inspired by motorcycle instruments, echoing the round and chrome-ringed exterior lamps that also draw on biking motifs. The large round tachometer and digital speedometer are both very clear and easy to read, but the rest of the digital display is less convincing. The left stalk proffers a couple of buttons and a rotary controller to summon up the various trip computer options, but it’s far from intuitive. I had to resort to the owner’s manual before I could get anywhere with it. My other big gripe concerns the front seats. I found it hard to get properly comfortable and after an afternoon of jumping in and out of various Aveos I had a distinct twinge of backache. 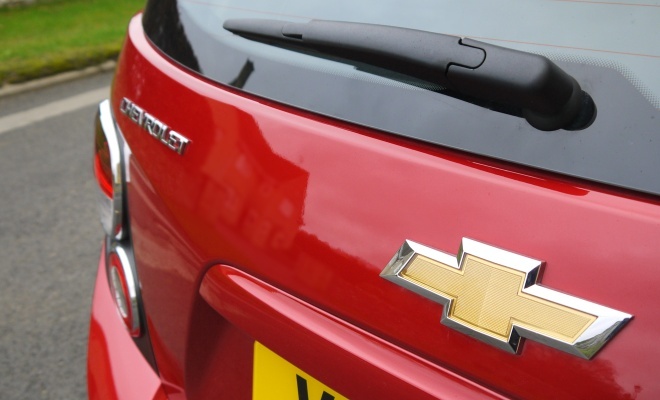 Chevrolet says the car is aimed at a youthful market and the audio gear is at least in tune with this idea. There’s an upper glovebox on the passenger side where, in all but the basic LS trim, you’ll find a mini-jack/USB connection. Alternatively, you can stream music from your handset to the car’s stereo using Bluetooth, with the two devices connecting without a hitch. 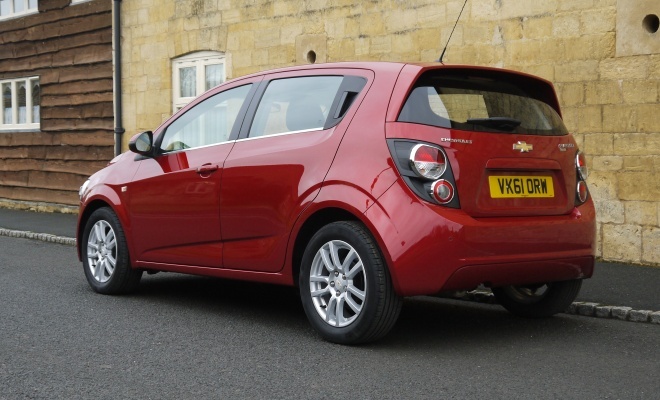 I’d never driven a Chevy of any description before sampling the Aveo, so I didn’t know what to expect. What I did know is that it must square up against the very stiffest of competition in the most fiercely contested segment of the European car market. I’m not so sure about the other models, but the Eco edition is a good car. It’s certainly keenly priced, undercutting the comparable Polo BlueMotion and Fiesta Econetic by around £1,900 and £1,500 respectively. And the new Chevy is slightly bigger, slightly quicker and just as safe as either of them. 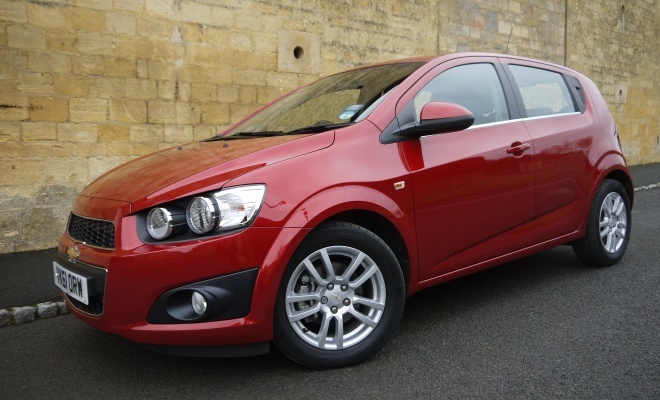 So if you’re in the market for a low-CO2 supermini, the Aveo Eco has to be worth a look.